With an increasing level of scrutinization of Boards, evaluating the performance of a Board and its composition is central to good corporate governance. Through our extensive research into Boards, we have developed a powerful tool that can either be used to complement a formal external evaluation process, or can be used internally as a tool to measure and identify areas for Board improvement. Effectiveness – focusing on processes, competencies and behaviours. In analysing and evaluating the performance of the Board and its members these themes are analysed both in isolation to identify any potential weaknesses, and as a whole to ascertain the inter-relationships that make a successful Board. Interfacing – examines how individuals relate, interact and cooperate across organizational and status boundaries. Certain people are more rational in their approach, paying attention to detail and focusing on getting the job done with minimal concern for how others feel, whilst others are more sensitivity oriented and are conscious others’ concerns and moods, focusing more on building relationships. 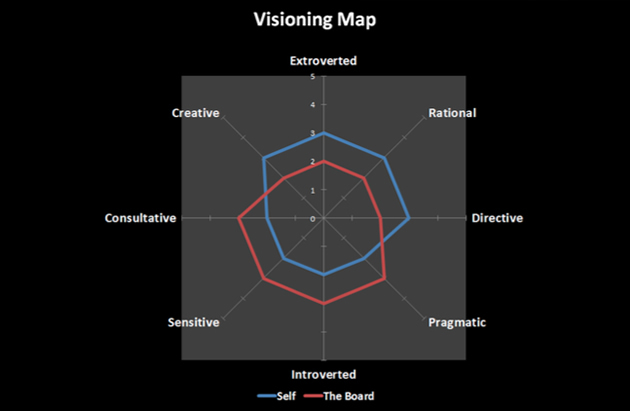 The example Visioning Map shows that the Board member’s self-scores reflect that they are more Consultative, Sensitive, Pragmatic and Introverted compared to the Board as a whole. Whilst this is not problematic, the individual has to respect the way things are done generally and work with others in sharing the vision for the future. Processes and structures – reviewing top talent performance and engaging in succession planning; the empowered support of Board committees; regular Board evaluations; frequency of Board meetings; and clear criteria for Board member replacement. Profiles and competencies – the right balance of skills, knowledge and experience; clarity of vision/strategy which is both shared and understood; and regularly reinvigorating Board membership to incorporate new ideas/talent. Culture and behaviours – capacity to adapt to risk and innovation; Board team dynamics; and identifying Board improvement opportunities. Board members are asked to rate how each measure is important to Board effectiveness in general and the degree of satisfaction with the performance of their own Board in practice. 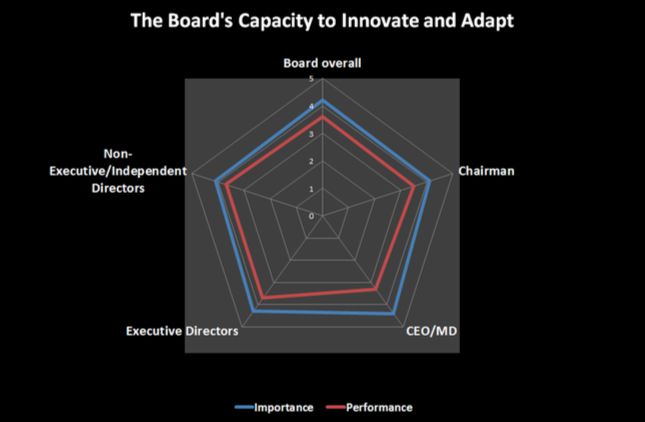 The example below shows how different members rate the Board’s capacity to innovate and adapt. Whilst the Board recognizes its importance the figure shows that each role rates the Board as under-performing, more so for the CEO/MD, where the gap between the Importance and Performance scores is highest.